Put It Between The Lines, People! Remember when you were a little kid and they told you to "Color between the lines"? Whenever I see a person who never got that concept - evidenced by how they park their car - I snap a picture. I decided to put a few of my favorites here. For example: Let's assume the genius above is entitled to park in a handicap spot. Why would you not use the actual spot? The spot (at a Home Depot) is already twice as wide as a normal car. More of this car is on the white stripes next to the spot than in the spot itself. By the way, none of these vehicles I am pointing to here are in empty lots or our at the nether regions of the lot. These are just people who really do not understand how parking lots are intended to work. Sometimes, it appears to be contagious. Look at the shoddy parking job of the person in the foreground: Were they inspired to park well short of the parking block because they were inspired by the maroon car in the next aisle? This kind of thing happens in Michigan in the winter when lots aren't plowed well and then the snow melts after people have parked. But this shot was taken in August. There is no excuse. I saw this car parked in New York City and made note of the nerf on his bumper. He had one in the front as well and I posted this pic at the time. The guy did not back his car up against the one behind him. When I walked by the first time there was no car in the back. That person saw the spot and just wedged up nice and close. Maybe they did it because they saw the bumper cover? Or maybe they're just a horrible parker. And I don't normally like to recycle stories here but this one deserves another mention. I wrote about it here. But it is not just one person. Several people share the silver truck on the left and most of them do not understand how parking lot lines are intended to work. Especially when they park next to my truck on the right. I took this pic a few days after posting the article. And yes, I have tried talking with them. The problem is, they do not understand what "it" was that I was talking to them about. So, I now park a hundred feet to the right of the spot in this picture, while these people live to the left. I did this shortly after I replaced the Explorer in this pic. Since then, I have watched in awe as the silver Explorer people continue to color outside the lines. Seriously, the entire lot is 99% empty. And Look at the right rear tire. I wonder if they have ever seen me photographing their truck? 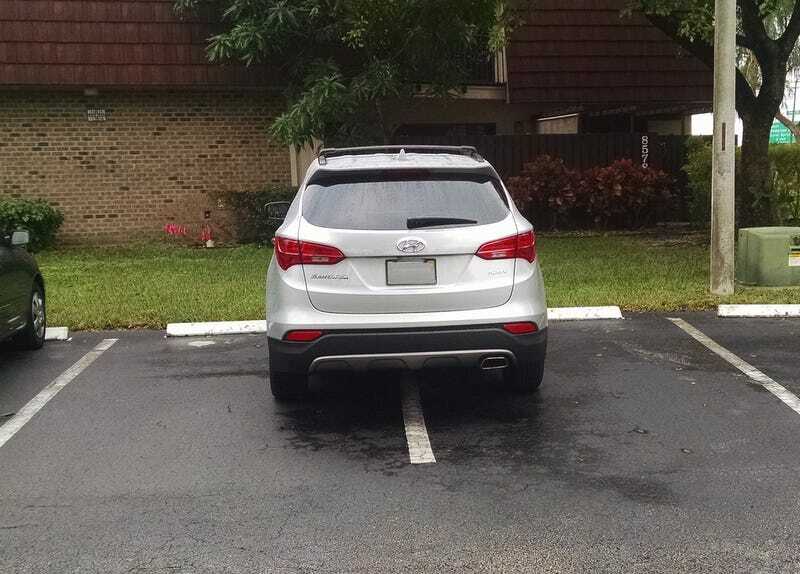 Maybe we should set aside a nice spot here for a big photo dump of bad parking jobs. It would take up quite a bit of bandwidth, however.